Living with the oven, well it makes a great conversation piece and it gives you the opportunity to blog on the internet about it. Also I think it looks aesthetically good in the garden. But I made the oven to cook with, and it doesn’t disappoint here. One thing to note, it can be a slow process, as you need to get the oven up the to correct temperature first. I suppose you have to ask yourself, what sort of BBQ person are you? Are you the type of person that wants a quick and instant result, or do you love the theatre and socialising of a BBQ? We are talking a minimum of 3 hours to get you oven up to temperature, so you need to plan and start the fire in advance of the cooking but is that really an issue as you have to make the dough, leave it to rise and then prepare the pizza before you cook. I say 3 hours to get to the correct temperature, but that is really for a party, I have cooked after 1 hour when there has only been 4 of us eating. I often fire up the oven to cook 4 pizzas for our evening meal. But where the oven comes into its own is when you have a party or pizza party. 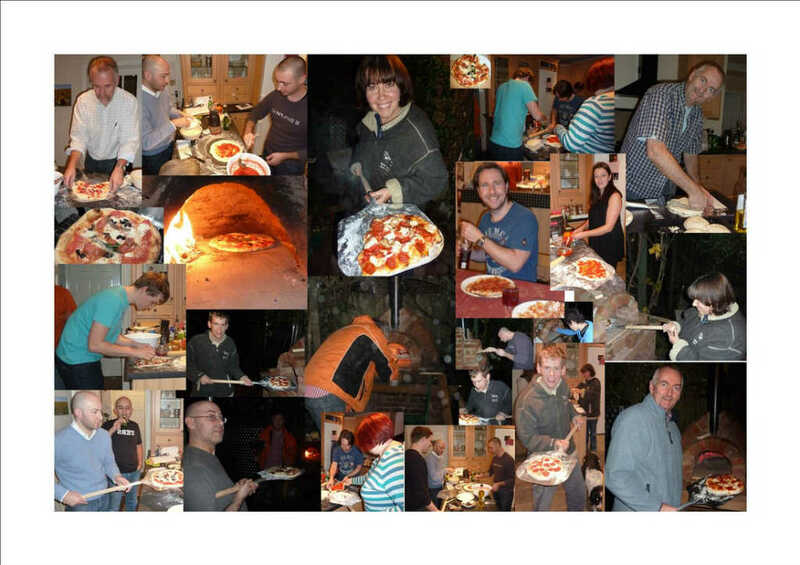 Typically I would be cooking 16-20 pizza’s at such a party. It is a very sociable event, I make the dough unless I have a couple of Italian engineers over. Then everyone makes their own pizza and if they want they can cook them themselves. Remember, it only takes a couple of minutes max and it is really cool watching your pizza rise and sizzle in front of your eyes. The other cool thing about getting your guests to make their own pizza is they can do their own stretching of the dough. Now the conservative ones will stretch with their hands, or even use a rolling pin. But the adventurous will try spinning and throwing like an Italian. The key point here is your oven is a social thing and your garden becomes your second kitchen. I keep talking about waiting for the oven to get to the right temperature. Well, there are lots of references on the internet to 800 fahrenheit or higher, but forget the numbers you will soon learn when your oven is at the the right temperature. My temperature guage only goes up 482 fahrenheit, so I don’t know what my max temperature has been in my oven. The bottom line the pizza should take about 60 -90 seconds to cook in front of your eyes. When cooking I do like to try and keep a small fire running whilst cooking the pizza, as the the temperature can drop a bit with the door constantly being opened. Note that it is a small fire, anything larger will burn the crust. One time after a pizza session with the family, I closed the door to keep the heat in. I came back 4 hours later before going to bed, and the oven temperature was still over 400F. I think my next party should be pizza’s at lunchtime and a slow roast lamb for the evening. The oven has been up and running just over a year, and I haven’t had any real maintenance to do. Nor have I had any cracks to repair in the core clay oven. I just sweep out the old ash from the previous session and then light up that days cooking session. 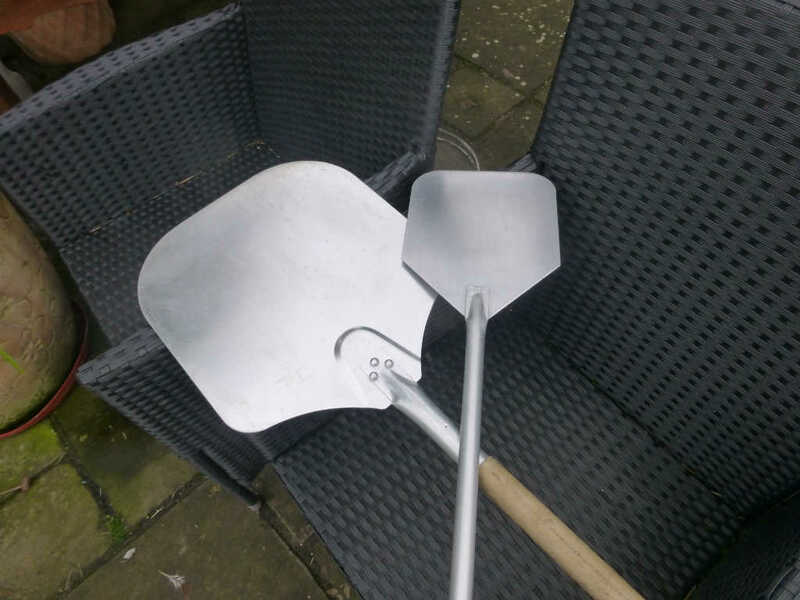 I also invested in a proper pizza paddle which was about the size of the pizzas I wanted to cook. These are great for getting the pizza in and out of the oven, but it is vital you don’t forget to put loads of flour on the base or you won’t get your pizzas off. The second time we cooked in the oven I had a couple of Italian engineers over to show me how an Italian makes a pizza, one thing they did put me onto was another smaller paddle which you can use to move, turn and manipulate your pizza. Excellent buy and one I couldn’t recommend enough!.